These days, more and more beauty brands are using branded content to connect with consumers who are consuming content. However, before creating content, it's important for any brand to have a solid understanding of the types of content women view as valuable. 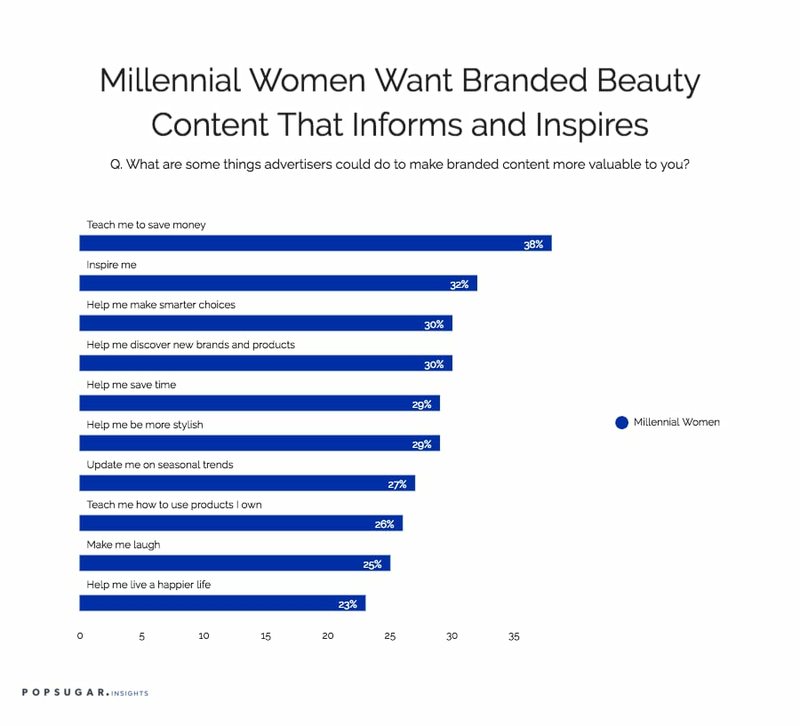 As part of the POPSUGAR Insights study "Beauty Evolved: How Millennial Women Shop for Beauty and Personal Care," we asked women to tell us what would make branded beauty content more valuable to their everyday lives. Millennial women have specific goals for branded content and want brands to deliver value across many aspects of their lives. Overall, 38% of millennial women want brands to teach them how to save more money, 30% want them to help them make smarter choices in their lives, and 29% want brands to help them save time. Nearly one-third of millennial women want brands to help with inspiration (32%), help them discover new brands or products (30%), help them be more stylish (29%), or help them stay up to date with seasonal trends (27%). Over one quarter of millennial women are looking for brands to help them learn how to use beauty products they already own (26%). But it's not all about inspiration and information. One quarter of millennial women are looking for beauty brands to help make them laugh and 23% are looking for brands to help them live a happier life. Branded content has the potential to deliver a marketer's message while simultaneously delivering information that brings value to the life of the reader, but in order to create content that engages and drives action, it's important for brands to understand what women want and the areas where women give brands permission to entertain, inform, and inspire.